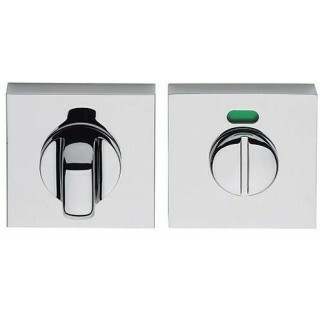 Colombo Design, bathroom door handle with emergency lock. Elegant design and refined details. Size 52x52mm. With red/green signaler. Round profile with grooved button for bathroom doors. It is used specially like children security system. Only a coin to open it. The refined design used in the construction reflects the efficiency of Colombo Design products. Equipped with signaling.